EZ-Gro Iron (Fe) 10% 10-0-0 is a plant nutrient supplement powder, which exploits amino acid chelation to enhance its bioavailability. Iron is an essential micronutrient that plays a critical role in macromolecule synthesis, respiration and photosynthesis as it acts as a prosthetic group with important enzymes. 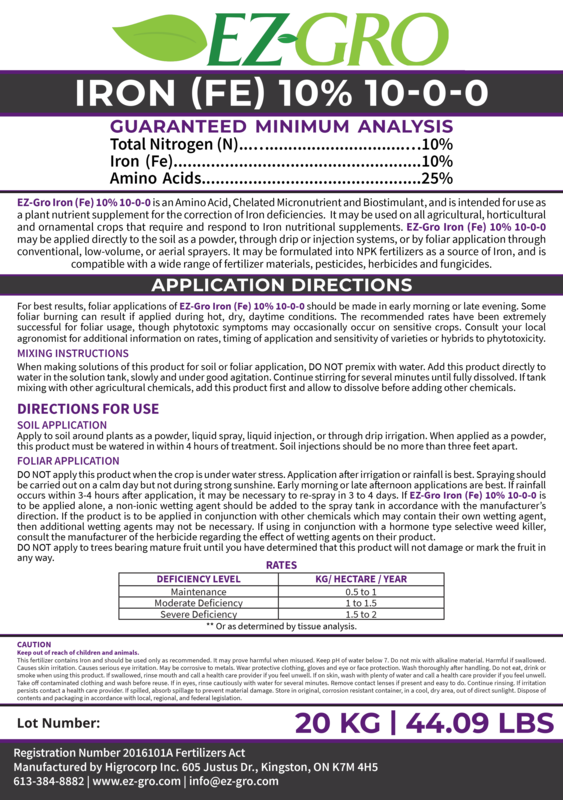 Add EZ-Gro Iron (Fe) 10% 10-0-0 to your current fertilizer regimen to remedy iron deficiencies and boost growth, yield and quality of your plants. See label for detailed usage directions. There are multiple Distributors around North America to allow for quick shipment. Find your closest Distributor.